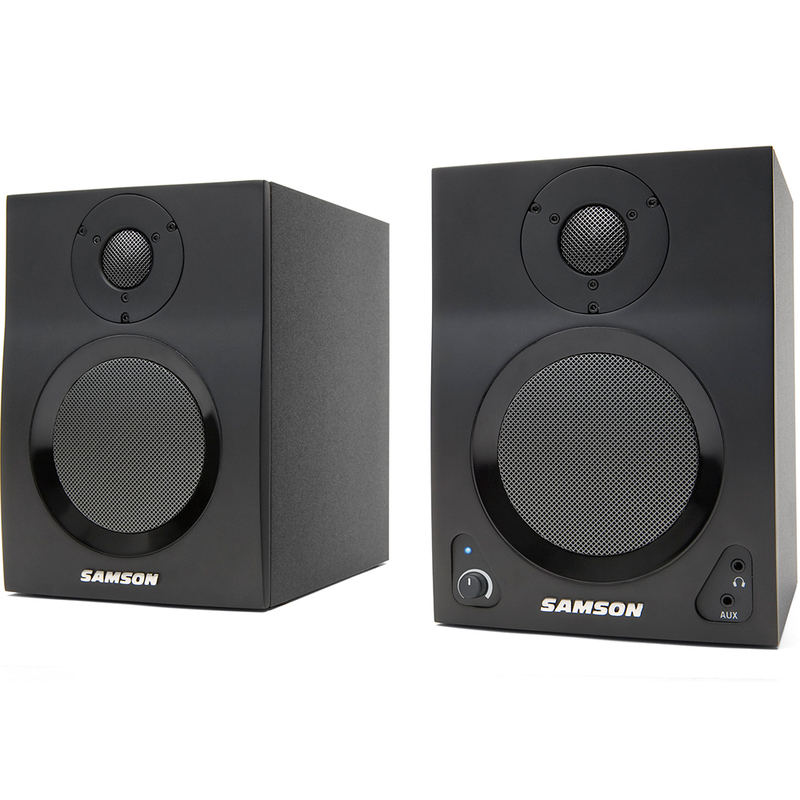 Samson’s MediaOne BT4 Active Studio Monitors are the ideal speakers for all your multimedia needs and feature the ability to connect to your smart phone, laptop or tablet via Bluetooth. 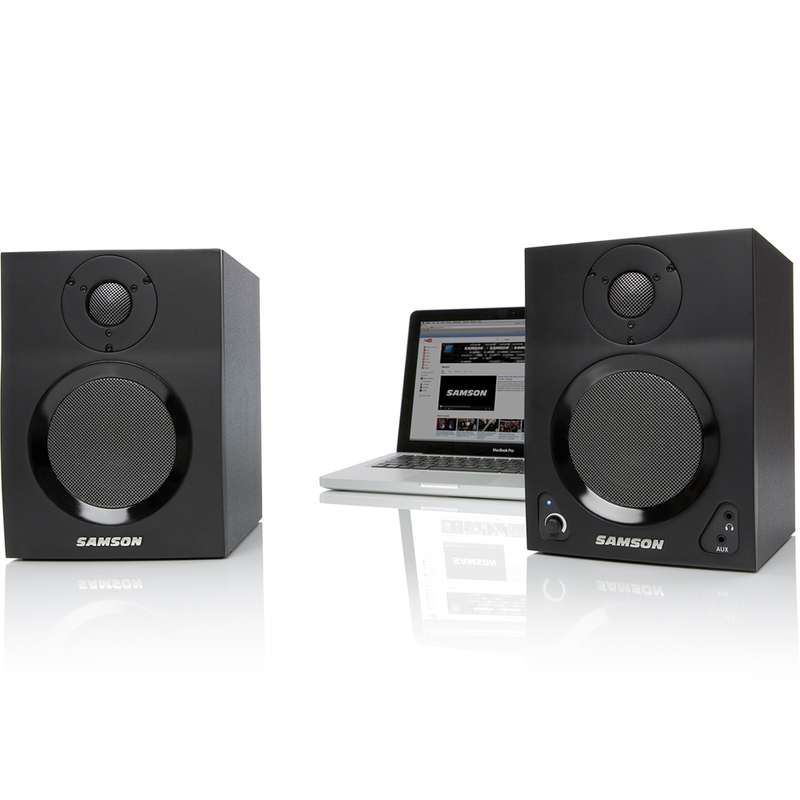 Whether you’re listening to music, producing tracks, watching videos or gaming, these monitors provide dynamic and reliable audio. MediaOne BT4 monitors feature the highest quality components, a stylish new look and are packaged as a stereo pair. MediaOne BT4 monitors produce 20 watts per channel RMS and 40 watts per channel Peak of full-range audio. Their 4-inch copolymer woofers deliver a controlled low frequency response, while their 1-inch silk dome tweeters give the high frequencies a natural sound without unwanted noise. Each rear-vented, precision-tuned port enclosure is finished in an all-black satin vinyl covering with matching metal grills for the woofers and tweeters, assuring these monitors look as good as they sound. Using Bluetooth, you can easily pair this system with your smart phone, laptop or tablet, and listen to your music, videos and other media applications through MediaOne BT4 monitors without wires. The Bluetooth pairing button can be found on the active speaker’s rear control panel, along with the system’s RCA inputs, passive monitor terminals and an AC power connector. In addition, the front panel houses an LED indicator, level control, as well as both a headphone output and stereo input. The 3.5mm stereo input can be used to connect secondary signal sources such as MP3 players, keyboards and more. With MediaOne BT4 monitors, you’ll bring the experience of listing to or producing music to a whole new level. Whether you’re listening to an iTunes playlist, streaming via Spotify or spinning a CD, your music will sound crystal clear and full of dynamics when pumped through these monitors. And you can control it all wirelessly via Bluetooth. In addition, MediaOne BT4s are perfect for integration into any music production setup, offering exceptional monitoring performance while tracking, editing and/or playing back a project. When used with video applications, MediaOne BT4s and their Bluetooth capability make all the difference. With these pro-level monitors connected to your smart phone, laptop or tablet, the sound of YouTube, movies and live streaming alike will be impeccable and enhance your enjoyment of all your videos. And you can still experience the full-range sound of your videos in quiet environments by using the system’s VOLUME control knob and headphone output. With the amount of attention being paid to the audio aspects of online gaming, MediaOne BT4 monitors will maximize the listening experience for gamers everywhere. Perfect for wireless sources, desktop setups, as well as gaming consoles. These monitors will make you feel like you’re in the game. 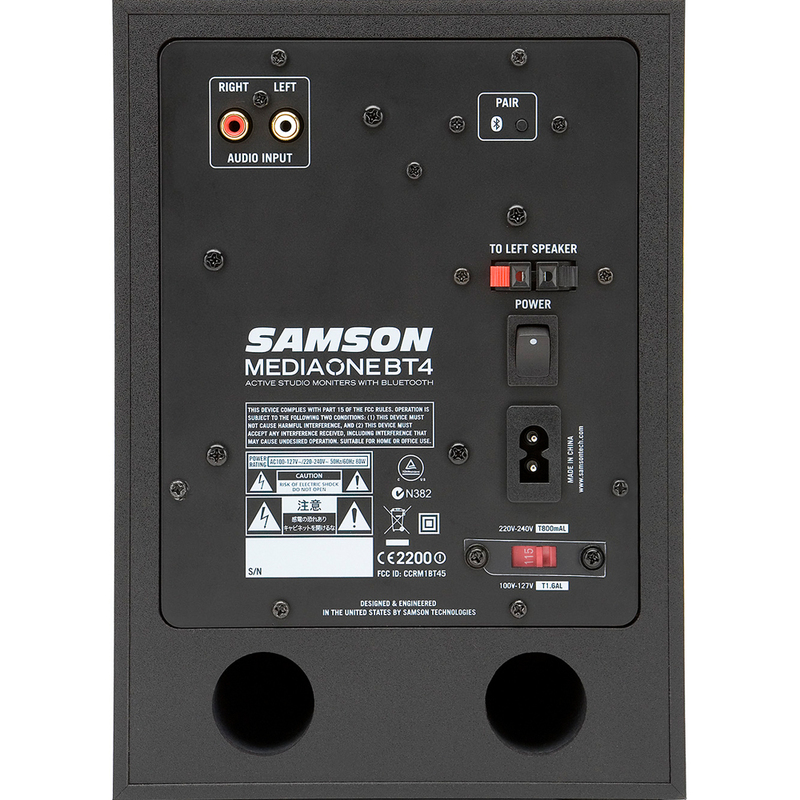 Providing dynamic and reliable audio reproduction with Bluetooth connectivity, Samson’s MediaOne BT4 Active Studio Monitors are the ideal speakers for all multimedia applications or wherever great sound is desired.